My andromeda shrubs are 15 years old and 7-8feet tall they have provided a beautiful border for many years. Our past winter was very cold and they seemed to have been having issues since then. When now shoots develop, they appear healthy with perfect leaves. After a few days, they leaves begin to cur, turn brown and eventually fall off. Many of the branches have turned "wooden" and can snap right off. The result is numerous gaps in the shrubs and a sad sickly look. Is this from root rot from the snow and ice? Can they be saved? We hope! We love our Andromeda's. They are one of the few shrubs that our deer will not eat. We have a few that eight or ten feet tall. My guess is that you have a borer that got into them? if that is the case; you might be able to save them with a systemic pesticide/fertilizer? You can also ask this question on our national "garden' forum: http://www.city-data.com/forum/garden/. Perhaps our moderator might move your thread there? There are plenty of 'experts' on the national level. I am having problems with my English Boxwood right now. The leaves are turning yellow - I believe they have a disease. There is one disease that does affect this shrub. It is a shame; because they are one of the few other plants that deer do not eat. Last year's hard winter might have hurt them? Hope you can save them. Welcome to our forum! PS Our wild turkeys will sometimes hide their heads in our Andromeda's to keep the rain off their heads - of course; the rest of their bodies get soaked! Try gardenweb -- best resource for plant info. This gave me the giggles! If you ever get a photo, please do post it here! I'd love to see it. 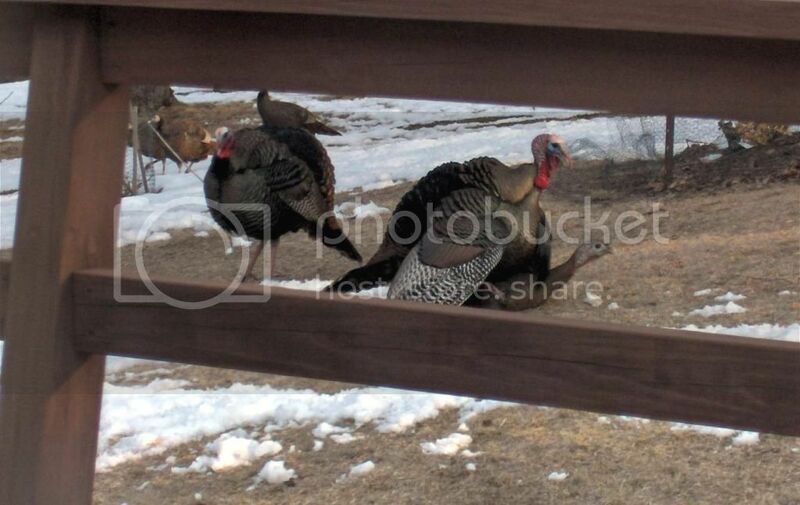 We've had wild turkeys visit our yard a few times, but just for a day or two and then they're gone again. I was so surprised. I thought for sure they had escaped from a farm somewhere.